Thirteen of us today, a cold, damp and somewhat windy day that made it seem colder than it really was. We set off for Winchcombe, with the Telehandler equipped with a bucket to bring some ballast for packing, and the Landie the forks by road for to finish off unloading the extension clearance train. 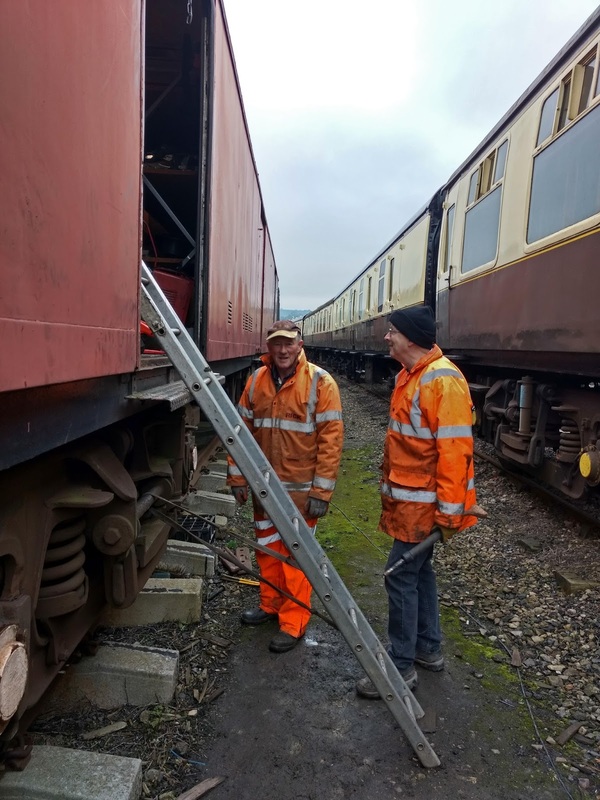 Here Rick and Peter wait by the 'serving hatch' (aka The GUV) at Winchcombe for an issue of Kango packing hammers from inside. Peter already has the sharp end of one in his hand, and we spent a merry 15 minutes trying to work out if the only way to get them on was the right way. It must be, but it felt wrong. 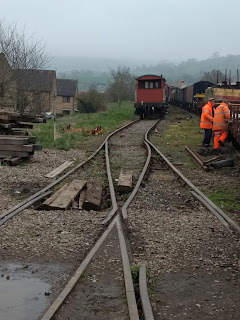 The third carriage set is parked on the right, as we are running just two trains today, both steam. And here we go, synchronised Kango packing. It's on a length of rail that was reported as moving up and down as trains passed, which of course we can't have. The affected stretch was marked out in yellow, so easy to find and off we went. 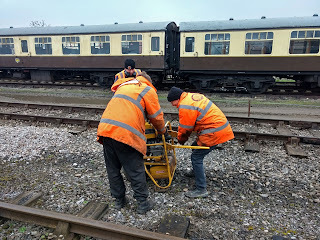 The Kango hammers are electric, so the power source was this generator that we bought up in the wheelbarrow. You can see where we are, just outside Winchcombe. Trains crossed here today, which made things easier for the lookout. 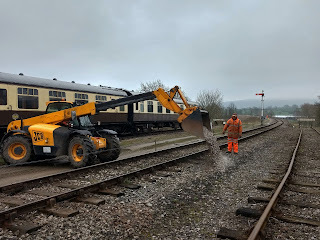 Bob brought the Telehandler down from Toddington, with a bucket full of extra ballast with which we could do the packing job. 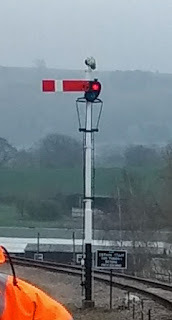 It was put along the affected stretch in two smaller piles, ready for use. Here's one of the piles, and also a second generator. This one is a diesel and it's made by Kango, so just right for the job. It's a strange little machine, arranged to act as a wheelbarrow that you push along. Just like this, in fact. 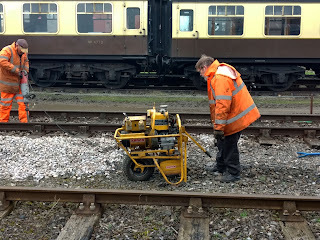 It has a big fat tyre in front, and folding handles at the back, so should roll easily enough over track ballast. Someone has thought about this, clearly. Dave here is having a good heave at it (beware of popping hernias) to move it along a few feet as the job progresses. Exhausted, and no feet further, Dave gives up. We realise that the rails around the front must be there for the extra men needed to drag it along the cess. Thought about that too, the men at Kango's. The starting handle goes in the back, you wind it round as fast as you can, and then drop the valve with the lever. More hernias are narrowly avoided. 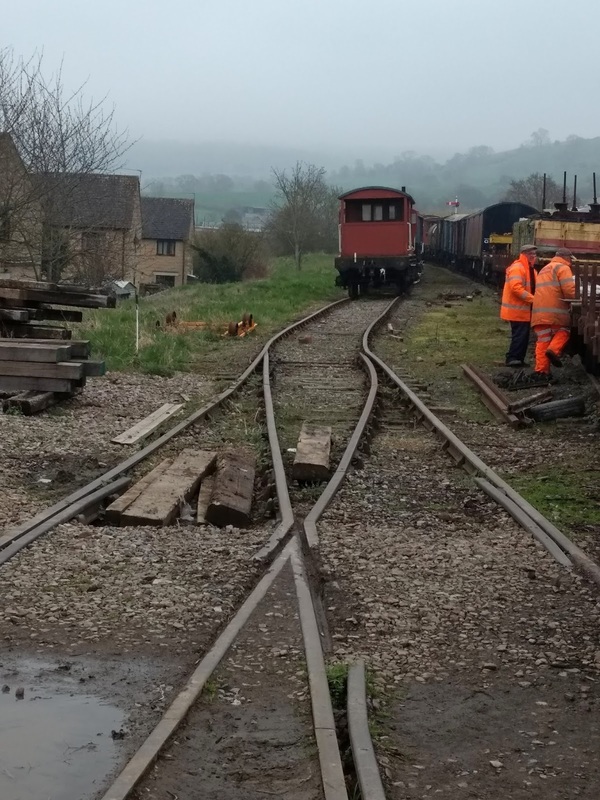 After a while the first train of the day makes an appearance, to cross with its sister at Winchcombe. 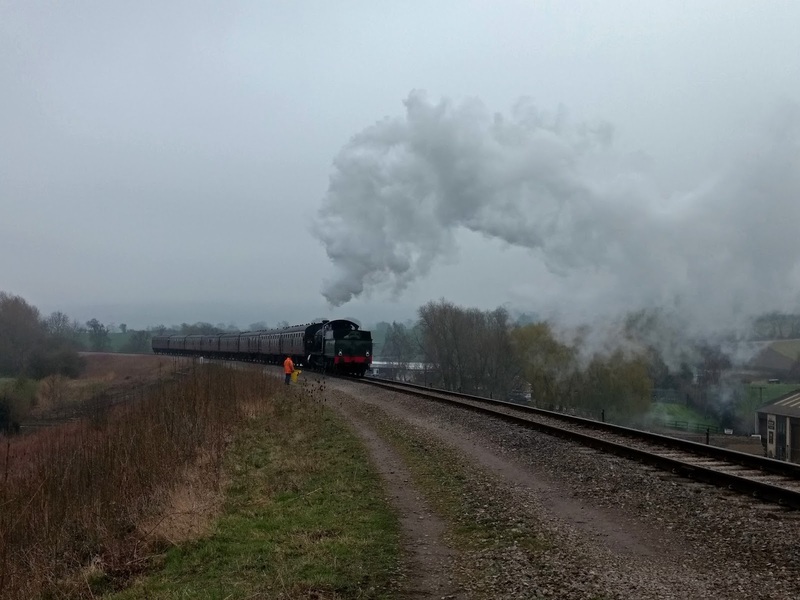 Here is Dinmore Manor coming round the curve, with lookout John bravely standing in a strong breeze on top of this high embankment with his yellow warning flag. Poor John, after an operation on his ankle a few weeks back, then has to race (hobble) to the other side of the job to wave the warning flag at 2807. 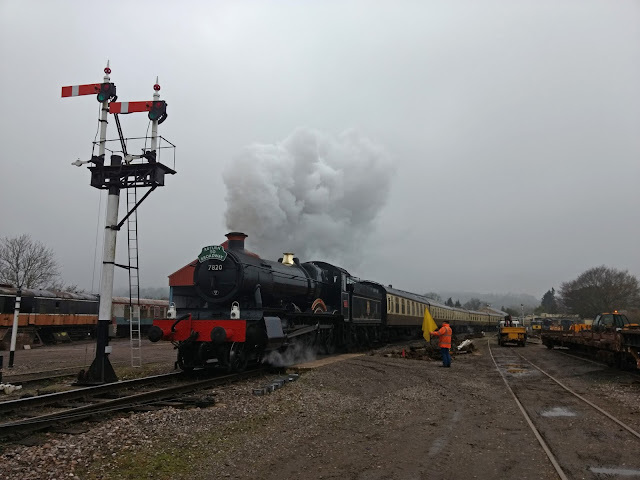 This train leaves Winchcombe after Dinmore was allowed in and has come to a stop. Tokens are exchanged, and off goes the heavy freight. John is there. 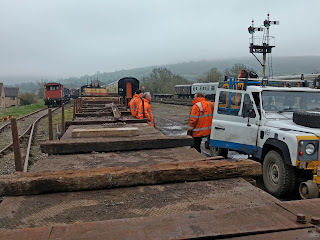 On the right you can make out the Landie and next to it you can glimpse the Telehandler, ready to remove offcuts of rail from the bogie flat in the picture. Lunch today was 'Al Fresco', and jolly Fresc it was too. Afterwards we warmed up with a hot mug of tea from the 'Coffeepot', and as a treat a slice of farmhouse cake. Good old Coffeepot, although we did sit outside with all that orange we had on, leaving the warmer areas for customers. There seemed to be plenty of faces at all the carriage windows that passed. No B&S blog today, due to the absence of their chief cameraman. We noticed they built this little ramp up to the (somewhat higher) door, and were still painting the fence they put up the previous week. 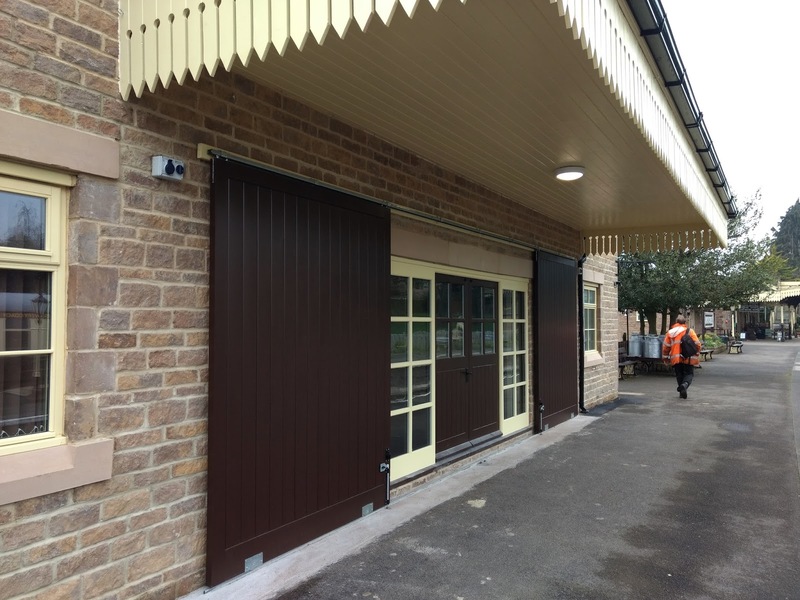 The Visitor centre has received as set of sliding doors, but once again all the fittings are modern and it only passes muster from a distance. An interesting curiosity in the yard is this turnout. It's a blast from the past, laid many moons ago when you used what you could find. 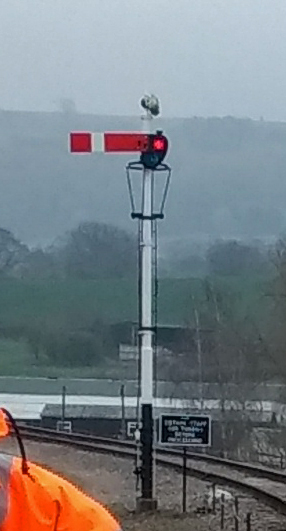 Here they really wanted a LH turnout, but apprently didn't have one, so used a RH one instead. You compensate with a sharp kink. Well, it is just a siding, rarely used. At the end of the day the stretch of track indicated had been packed with the Kangos. 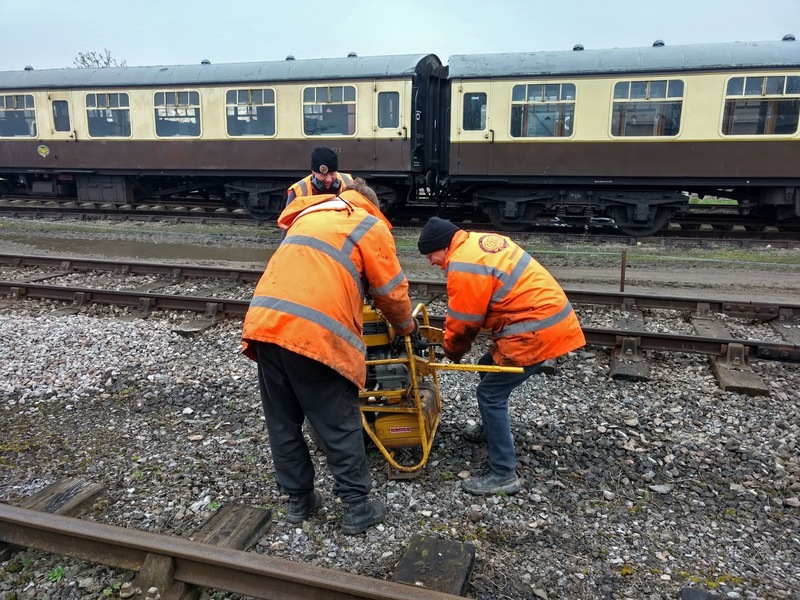 The electric power makes the job easier, but it's still manual labour and quite hard work. So is lifting all the heavy kit out of and back into the wagons. 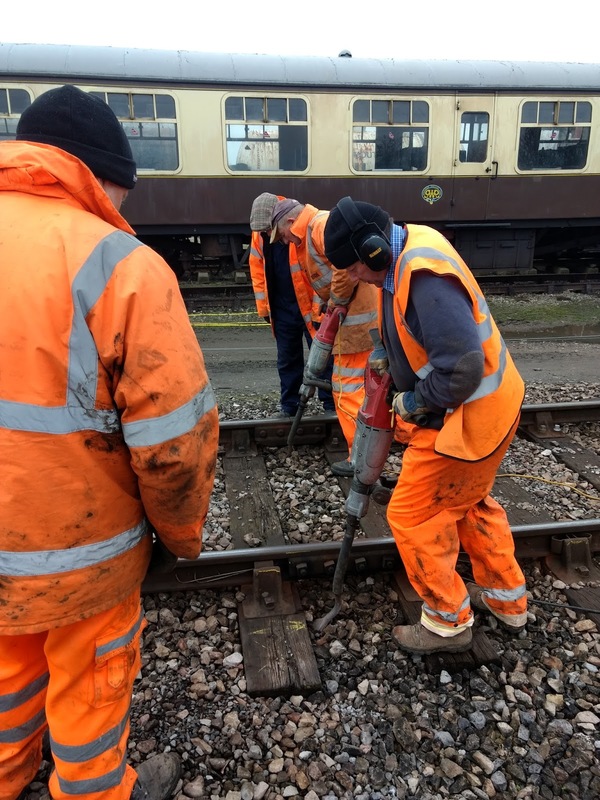 The other half of the team did a great job on clearing all the odd bits of rail off this bogie flat. 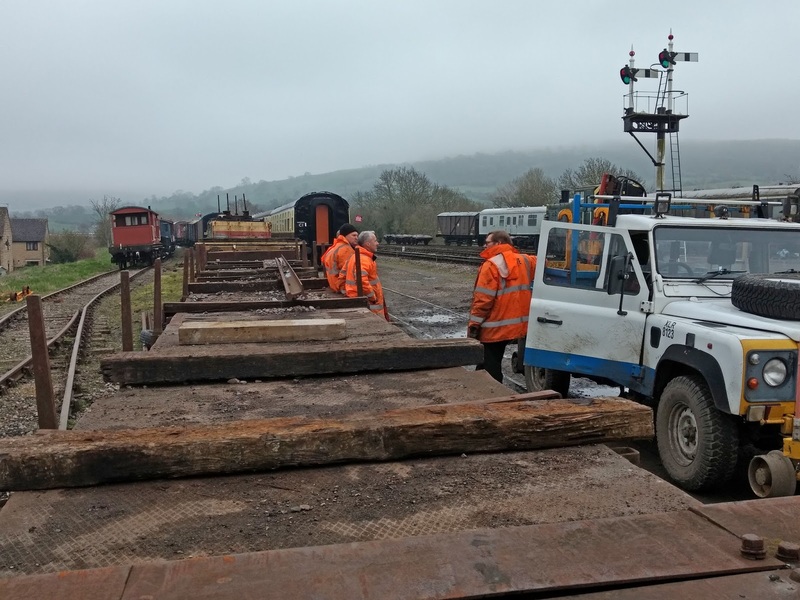 Only one length left on it now, an IBJ which belongs to someone else, so will be taken to another location on our railway. Thanks for the update, Jo. 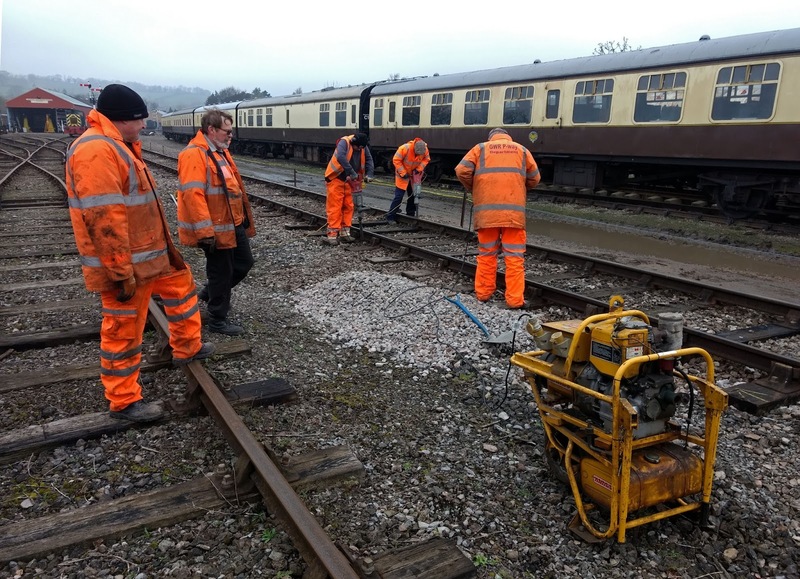 What's taken nearly a day's work could have been done in a couple of minutes by the tamper! 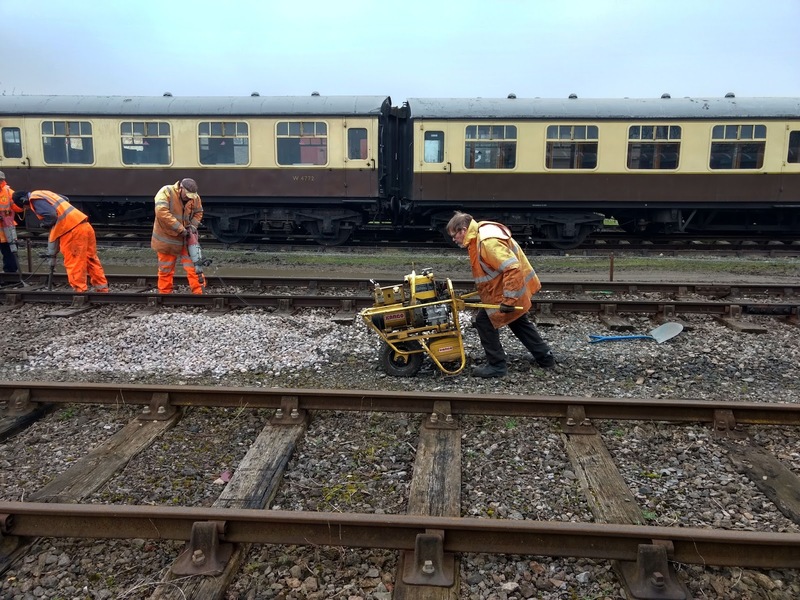 Hope your repacked ballast is now doing its job. 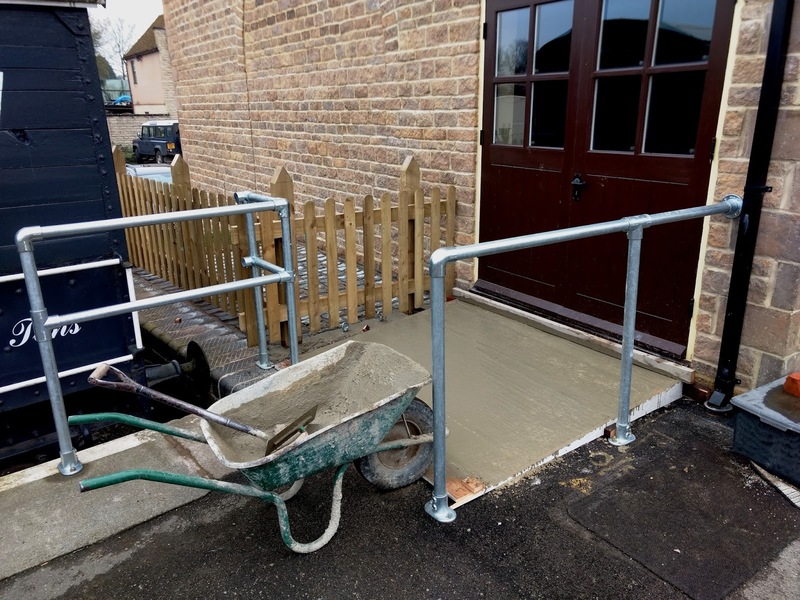 What is the purpose of the ramp on the visitor centre's double doors? It looks like it still leaves a couple of inches step up at the entrance, so not really good for wheelchair access? And there looks to be a step up on the platform side too. Is there no proper access for disabled users? The doorway is used only for exit , there is level access into the building from two other doorways . 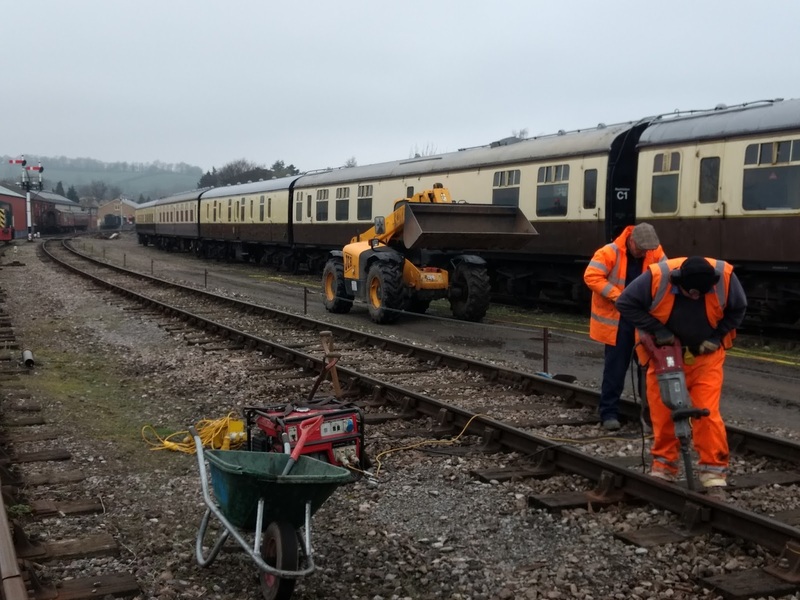 The Winchcombe building looks a fine addition as a facility but we do need it to look the part for a heritage railway. 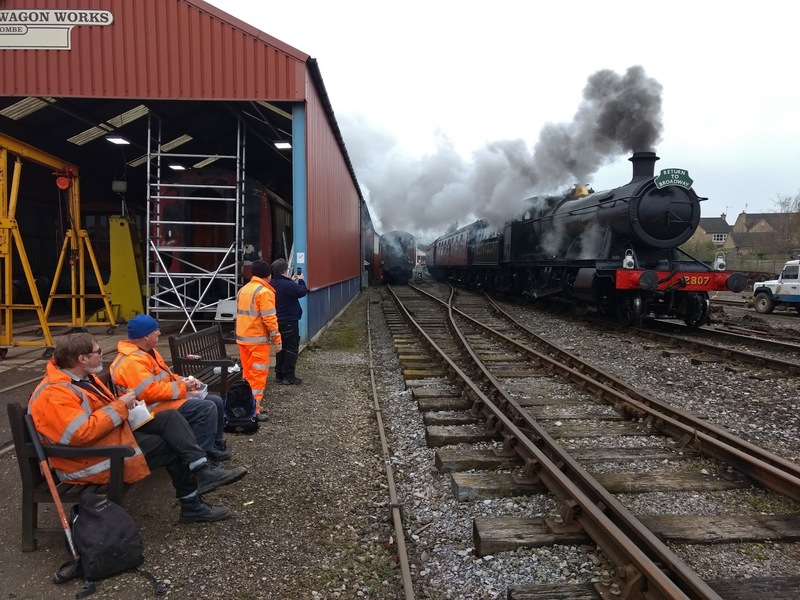 These comments are meant constructively, I must stress, but I agree that it would be nice to have more authentic light fittings, safety rails and door furniture. Presumably that would be low cost to rectify, and lower if got right first time? It was built at a time when things only had to 'look right from a distance'. We have done much better with Broadway. We are certainly capable of doing it. The metal handrails don't even look right from a distance! They really do stand out, at least everything else sort of blends in, even if it's not right. Jo, thanks for taking the time to bring us will all the news. Are any of the short lengths of rail for sale & are they flat bottom? They make useful anvils. 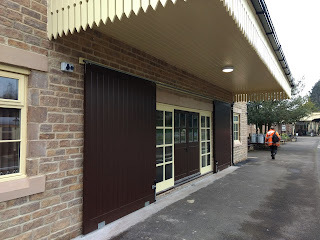 I had a look at the visitor centre at Winchcombe the other week, and noticed some cracking in the stonework above those double doors. The lintel above the doors appears to have shifted outwards slightly, too. I wondered if the foundations have sunk a bit on that corner, pulling the stonework out of true - or possibly causing the building's steel frame to move. 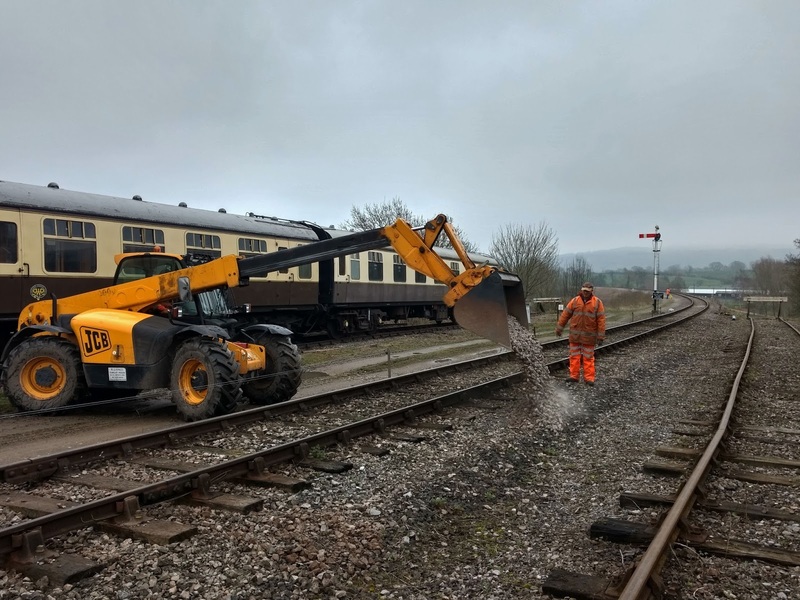 The building is situated on the side of a low embankment, and as we know, the Great Western Railway's early-1900s earthworks are not necessarily strong and stable. 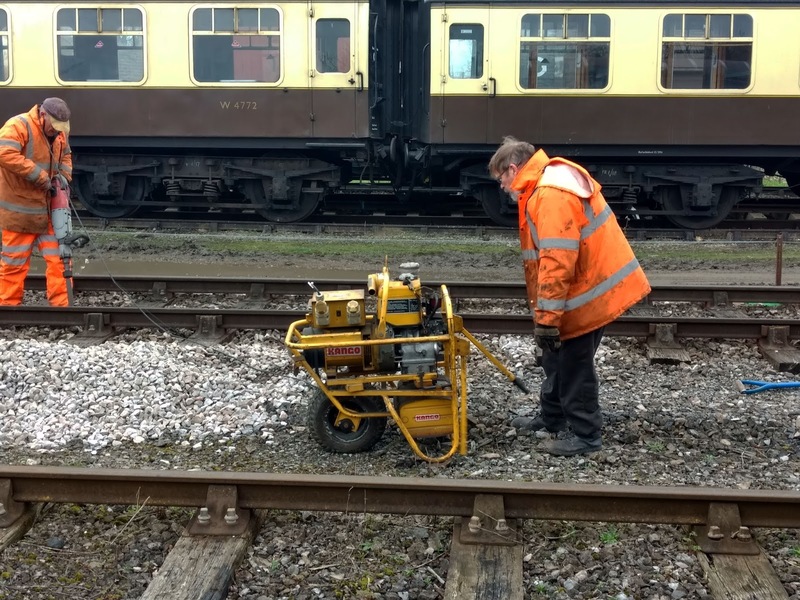 If the building's foundations were dug to the standard depth (about 4 feet) it'll be sitting on the GWR's soft earth. This may be what is causing the foundations to sink. I just looked up a photo of the building at the foundations stage, and it does seem they were standard trenches, dug to roughly the level of the base of the adjacent platform. 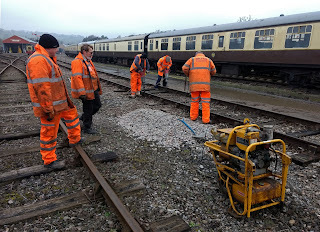 In fact some of the earth might actually be infill dating from when Winchcombe platforms were rebuilt in the 1980s. 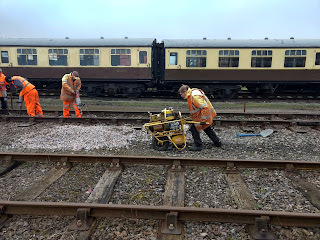 Personally, I would have gone down a lot deeper, until I was sure I was digging into the original ground, not just a pile of soft earth heaped up by the GWR's navvies - or the GWSR's volunteers.